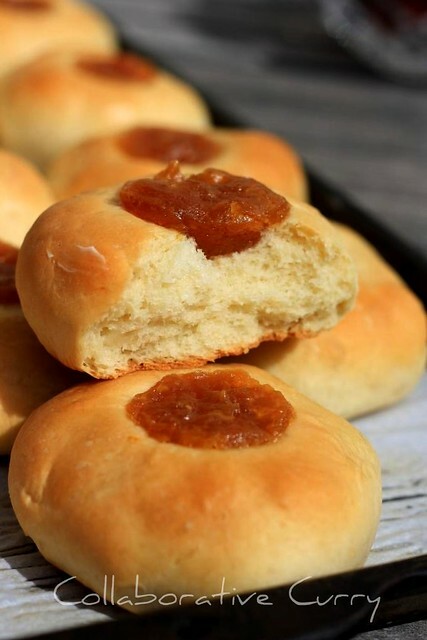 Kolache (also spelled kolace, kolach, or kolacky, from the Czech and Slovak plural koláče) is a traditional Czech bread stuffed with dried fruits or cheese compote. I preferred a dried fruit filling for this recipe. This was made a while back and is from my drafts. It is an apt time to use recipes from my drafts, because I am not keeping well. No, there is no serious illness, but some aches and pains that need resting. This recipe is from the book ‘Bread Bible’ by Beth Hensperger. I read a lot of good reviews about her book; the only criticisms perhaps is that the book does not feature whole wheat breads. It encouraged me to pick up the book and when I flipped through its pages, I was sure hooked. The pages took me down memory lane- good times in Germany to be precise. If you are from Germany or have been there, you will know how wonderful the rolls from the bakeries are. I was thrilled to find this book which reminded me of some of those rolls. The recipes definitely hold their own when compared to the authentic recipes I am sure. Now I am no expert in Czech nor German cooking but I am just saying I could follow the recipes from Bread Bible quite well and they give good results. Also the impression when I read the recipe was ‘daunting,’ but soon my fears were laid to rest because once you start getting practical it works like a charm. It really does! Hope you are encouraged enough to try them yourselves. 1. Mix the yeast, warm water and bit of sugar, from the 1.5 Tbspn mentioned under rolls, in a small bowl. Stir to mix well and let it stand till it's frothy. 2. In a large bowl mix the rest of the sugar, warm milk, lemon zest, egg, salt and 1 cup of flour. 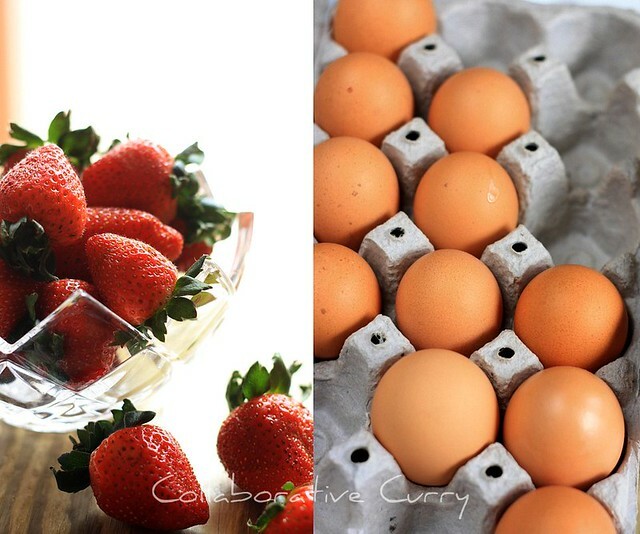 You could either mix using an electric mixer or whisk by hand. 3. Beat well for one minute. Add the yeast mixture and ½ cup more of the flour. Beat for another minute. 4. Now add the butter pieces and beat until incorporated. Add the remaining flour, 1/4 cup at a time and after 3 cups a tablespoon at a time, until a soft dough that just clears the sides of the bowl is formed. 5. If you are using hands, turn the dough onto a lightly floured surface and knead for about 2 minutes. If kneading by machine, change to the dough hook and knead for 2 minutes. Do not add too much flour, or you may end up with dry dough. 6. Place the dough in a greased deep container. Grease the top of the dough as well. Cover and let rise in a warm place for about 1 1/2 hours or until the dough has doubled. 7. Meanwhile, prepare the filling. Combine the dry fruit, fruit bandy and enough water to cover the fruits. Boil, reduce the heat and cook for about 20 minutes or until the fruit is tender. 8. Drain if there is a lot of liquid, reserving 2 tablespoons. Mix the warm fruit, lemon zest and juice, butter and reserved liquid in a food processor and blend until smooth. Set aside or cover and refrigerate until needed. 9. Deflate the dough by punching down and turn onto a lightly floured surface. Prepare a baking sheet lined with parchment paper. 10. Divide the dough into 2 equal parts and divide each part into 6, making 12 rolls. 11. Cover and let rise for abut 30 minutes. 12. Preheat the oven at least 20 minutes before you start baking at 350 degree F.
13. When the rolls have risen well, make an indentation with your thumb or back of a wooden spoon. 14. Fill with the prepared dry fruit filling and bake for about 18-20 minutes or until the rolls have turned slight brown. 15. Cool on a wire rack. 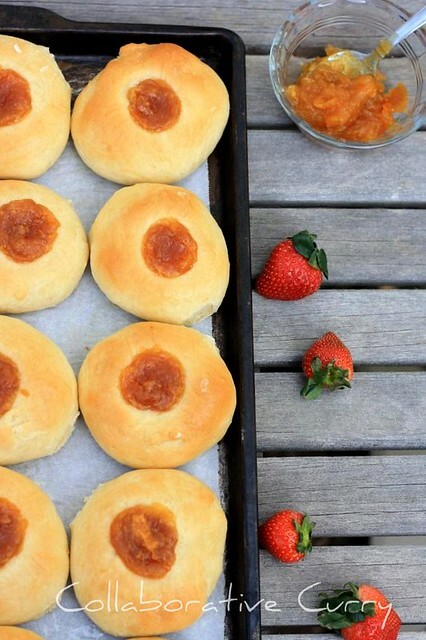 1.These mildly sweet rolls are light and delicious. 2.You could also use a cheese filling for this. Unfortunately I don't have a recipe to share right now. I never heard about this, but it sure looks very delicious and lovely! 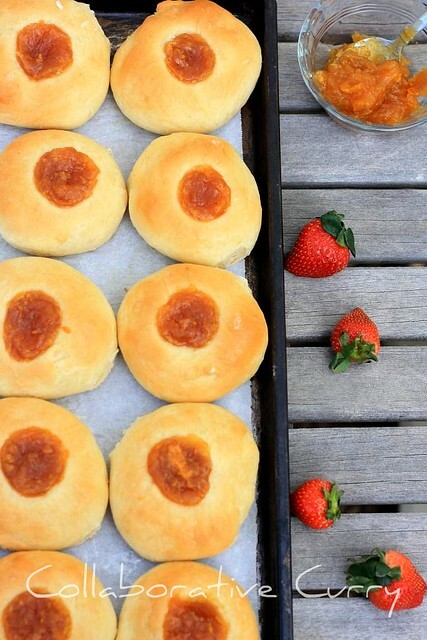 Kolache looks delicious with jam filling. 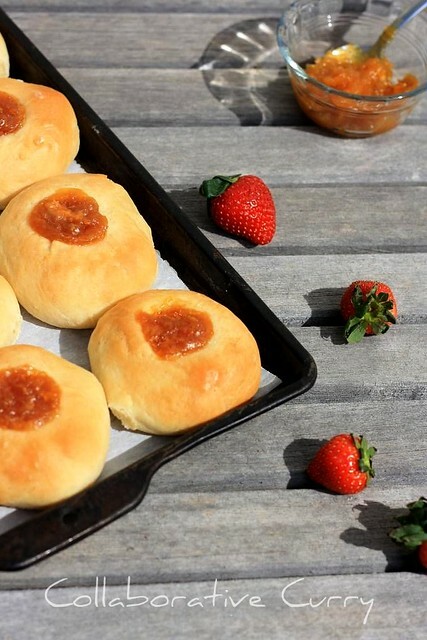 Kolache looks simply gorgeous with jam filling..
Looks so lovely and gorgeous..
Beautiful rolls they look really tasty. Its new dish to me never heard about it.Feels like grabbing. Looks super delicious....hope you feel better soon. wow...wonderful recipe.....i loved the fruit stuffing very much ! These sound really delicious:) I like the idea of a touch of sweetness in a bread. Kolache looks very delicious and fulfilling. They look lovely... Makee me want to have one rite now !! Sounds new and interesting ! Looks gorgeous and filling..adipoli pic dear. beautiful pics dear!....perfectly baked tooo...mail me a few! Something pretty new to me, looks delicious though.. Wish you get well soon Nami. Very interesting bread rolls. Just reminded of the breakfast in Frankfurt airport...some rolls like this,with a complicated name in German! Interesting, first time hearing about this food! thanks for the info! Oh how pretty, you have done a great job, wish i was good with baking bread! Those rolls with some preserve looks fantastic.